I shot myself. It wasn’t deliberate. It was an accident. I was at my son-in-law’s place near Ft Scott, Kansas. It was the first and probably last time I was invited. Several of our grand kids were there. 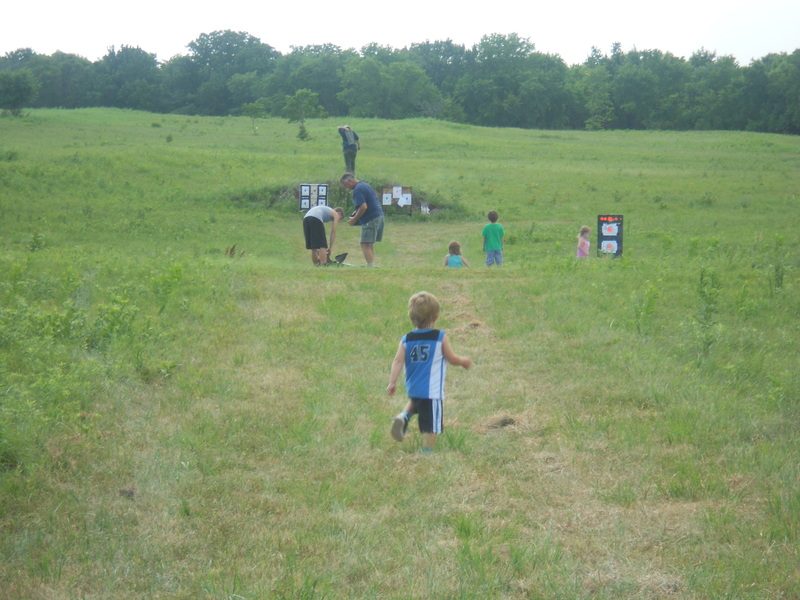 My other son-in-law had set up targets at various ranges, and we were very carefully taking turns shooting our various weapons at the targets. We had AR-15’s, a Remington .270, several pistols of various calibers. I had brought my AR-15, two other rifles, five pistols and even my compound bow. 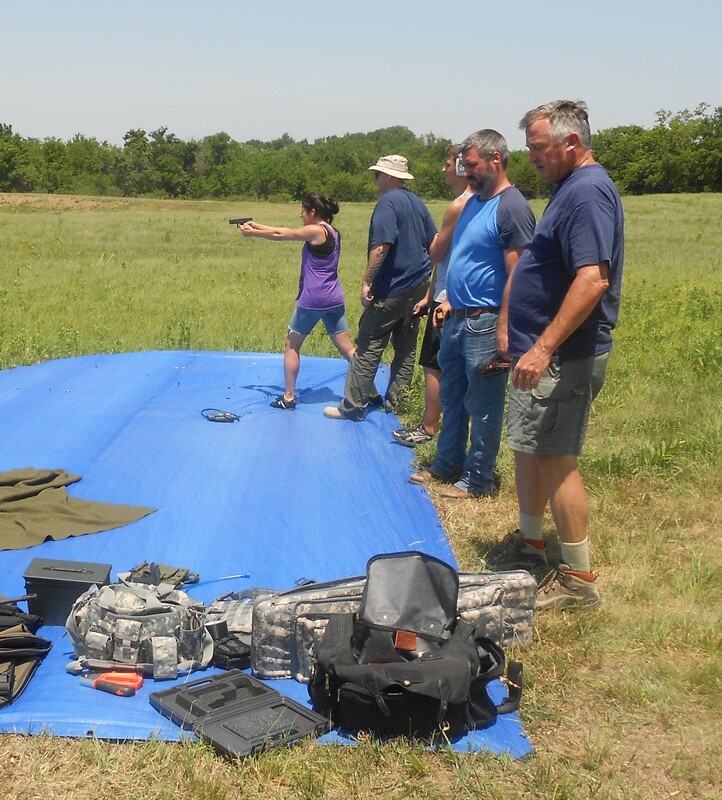 It was very hot, but we had fun practicing our marksmanship skills. 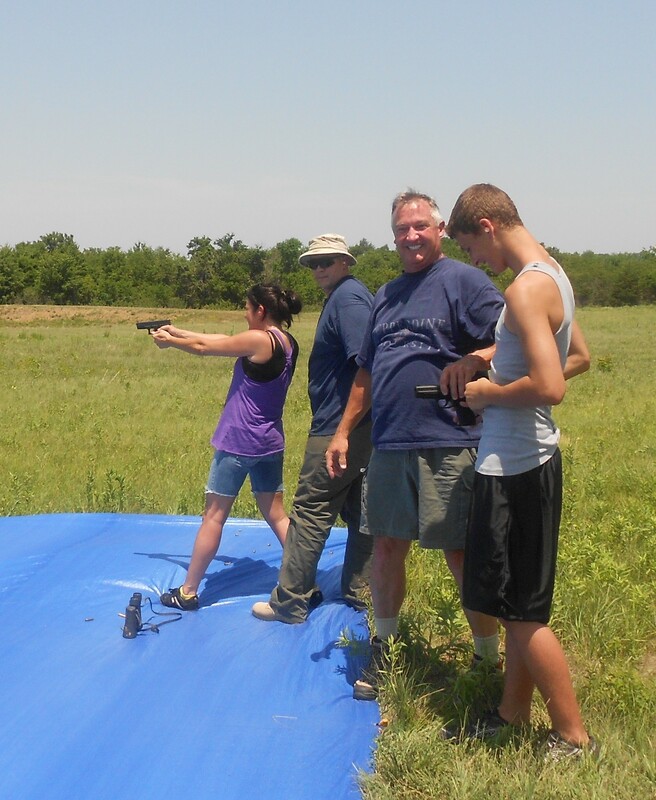 I’ve always believed that the family that shoots together stays together. It was close to 4pm and we had spent most of our ammo. I had discharged all of mine, I thought. So everyone goes down to pick up the brass and pack away the firearms and bring them up to the cars. I started putting away my various weapons. 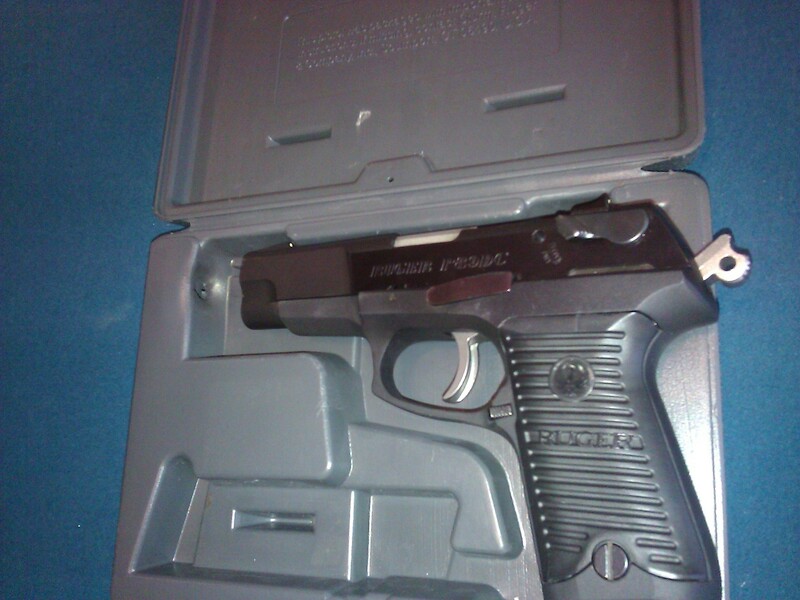 I was putting my Ruger P89c 9mm into the hard plastic case. The hammer was back which is common when all the rounds have been discharged. I made my first mistake at that point. You always assume the pistol is loaded. I did not check the chamber. If I had, I would have discovered a round. The next lesson I learned is the need to know each weapon you have, for they are all different. What I thought was a decocking safety, was in reality a decocking lever. Instead of safely withdrawing the firing pin and closing the hammer, it engaged the hammer and drove the firing pin into the live round in the chamber. The result is noted in the pictures. 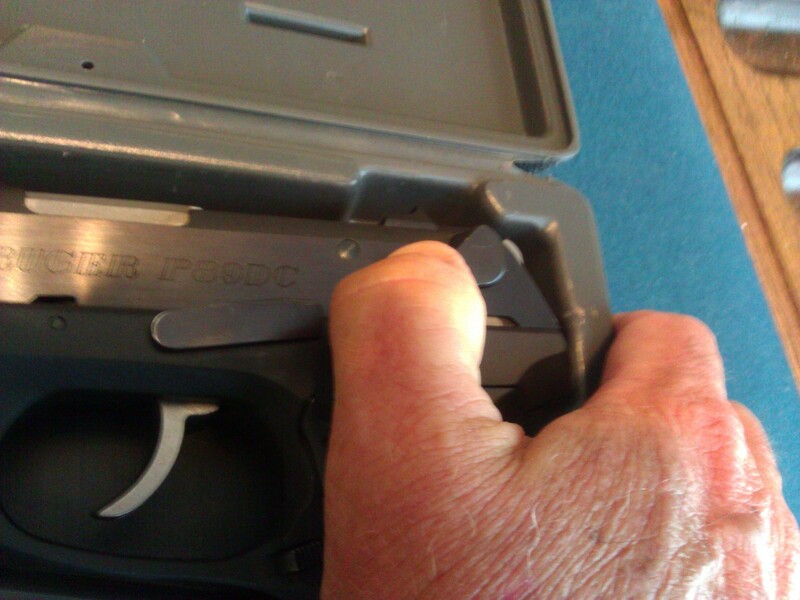 The bullet discharged and went through the hard plastic case, and then through my hand, which had been holding the case. All I remember was the horriffic explosion, and dropping the case at the very same time. I did not immediately feel a pain in my hand. 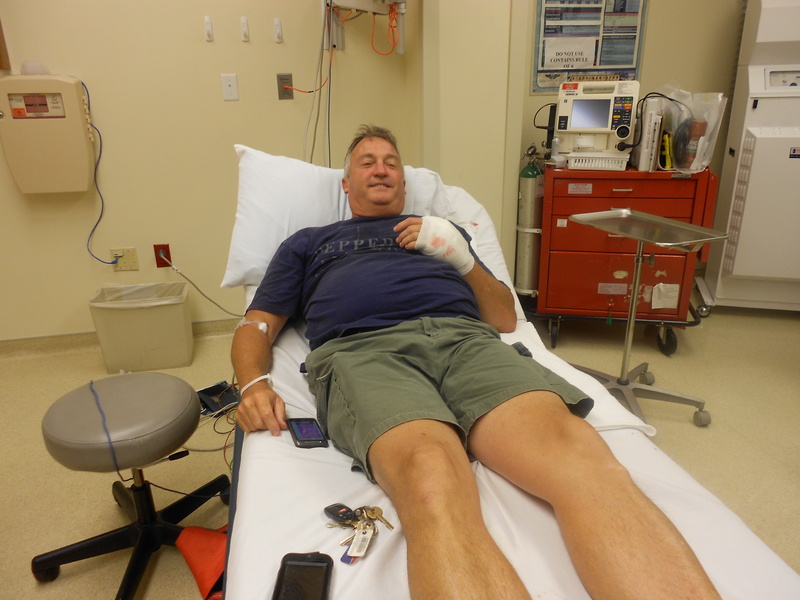 My wife started yelling, “You’re bleeding!” and that is when in a cloud of smoke I noticed my hand, blood streaming from a hole on top, near my thumb. I was in a daze! My son-in-law, Ben, ran toward me, taking his shirt off as he ran. He tore a strip of the shirt off, and tied it directly over the wound, stopping the blood flow. He said the closest hospital was in Ft Scott, 20 plus miles away. I was surprisingly calm. The only pain I felt was the discomfort of the tourniquet and the pressure slowly building in my hand. The drive to the hospital seemed to take forever, but I never grew queasy or lightheaded. I used my phone to track down the location of Mercy Hospital in Ft Scott. Exit wound. Big John is holding the tourniquet tight! I found out that when you walk into the Hospital and announce, “I shot myself,” they react very quickly. No “Have a chair”, no “please fill this out”. I walked right back to the ER room and laid on a bed. Next thing I know a big EMT named John is taking the tourniquet off and saying, “Yep, you shot yourself”. 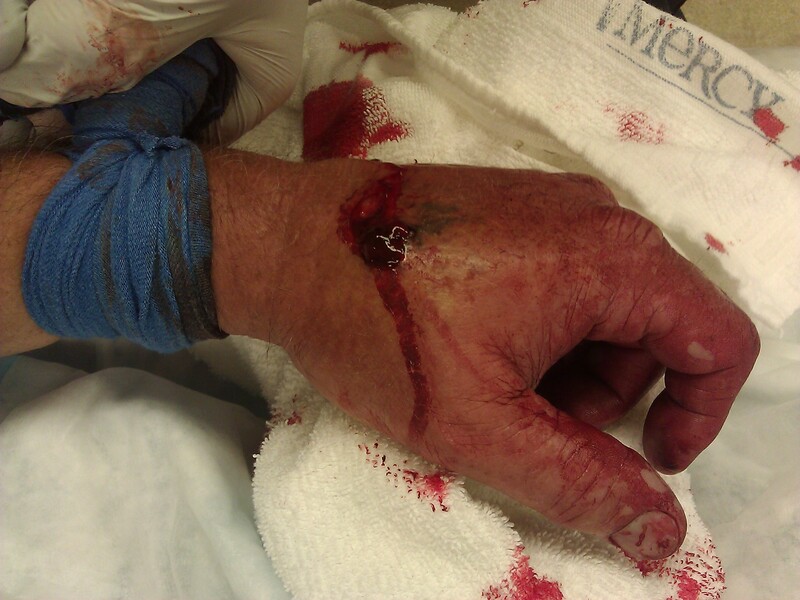 He then moved the tourniquet up my wrist and for the next 45 minutes twisted it tight. I really enjoyed talking with John. He is quite the hunter and fisherman. He didn’t make me feel stupid for shooting myself. The pictures tell the story. When they first dismissed me, we went to Walmart to get the pain pills and antibiotic. While I was at the window blood started gushing all over. The lady got me a couple Walmart bags to catch the blood. Blood-soaked bandage. Notice the Walmart bags. 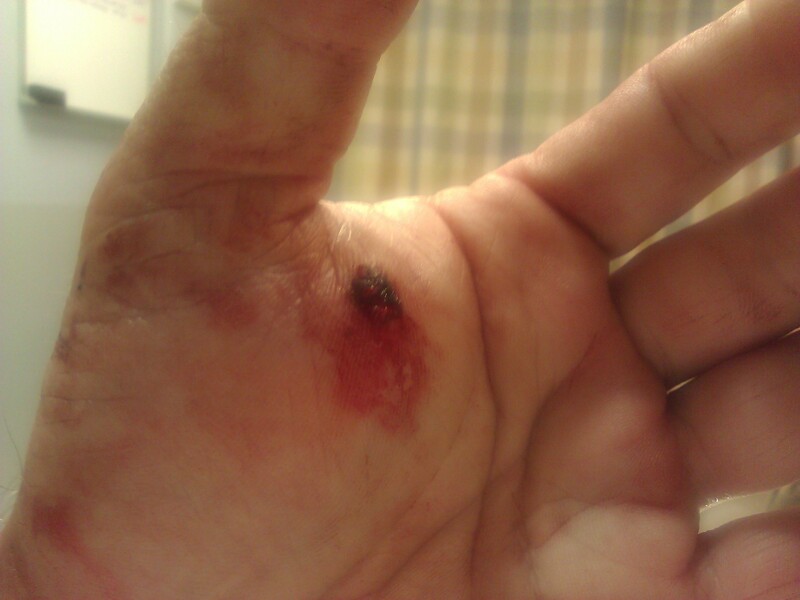 They felt there may have been an artery nicked, and told were not equipped to operate on my hand, so they contacted a Doctor at Olathe Medical Center who agreed to take me as a transfer patient. He was a Plastic Surgeon evidently skilled in hand surgery. So we drove for an hour or so to the Emergency Room at Olathe Medical Center. 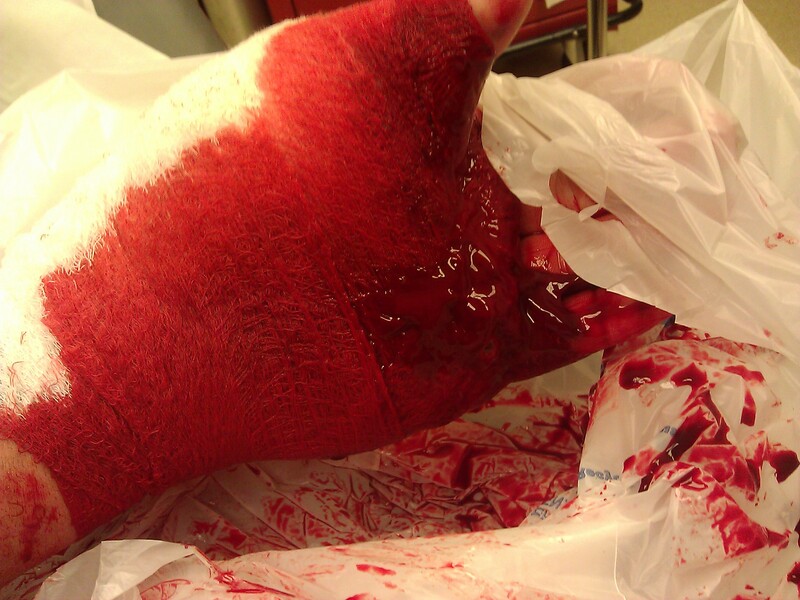 They had wrapped my hand in a pressure bandage, and even with pain medication, it was very uncomfortable. The service there was quite slow. I would see someone every 45 minutes or so. As it turned out, I never saw the Plastice Surgeon, only Dr Roberts, an ER Doctor. 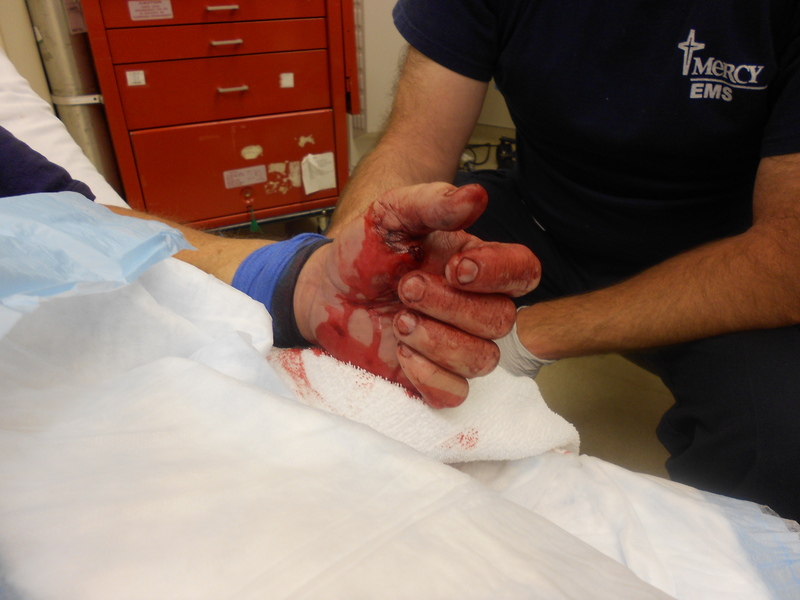 Since the bleeding had stopped, and the X-Rays showed no bone damage, and the paper clip test (yes-paper clip) showed no nerve damage, he saw no need for exploratory surgery. He did cleanse the would with a 18 gauge – no make that a 16 gauge (his exact words to the nurse) catheter. So some more shots in the wound. Finally about midnight I could begin the 40 minute journey home. We had some good friends, the Carrin’s and the Shelton’s come and visit us there. What do you say to someone who shot them self? “At least now you can Praise God with Holy Hands?” I really appreciated their encouragement. What else did I learn, besides the need for better gun safety? I learned that God is present, even in the dumb moments of our life. My heart was filled with such a joy, such an awareness of His presence. I found myself thinking of what it must have been like for Jesus Christ, a Roman spike tearing through his hand, and how he had to support himself for hours, all the time feeling the searing pain of that spike against his bones and his nerves. My experience was nothing compared to His, yet I could pray with Paul in Phil 3:10 that I was thankful I could share in the “fellowship of His sufferings”. Most of all, I was thankful that I was the one hurt, and not my grandchildren. God is Sovereign, and He could have led that bullet anywhere. I would much rather be the one who suffers. I am also thankful that the injury will not result in any permanent damage. I have already ridden my bike to see how it did, and it was OK. I plan to swing a golf club this week. I still plan on hiking Mt Whitney in August with my long-time friend Don Porter. God is truly wonderful, and His mercies are new every morning. We can praise Him in the good times, but most of all we can praise Him even when we shoot ourselves!